New Delhi: The BJP Sunday termed the opposition parties meeting in Delhi an exercise “to find excuses for their impending massive defeat” in the Lok Sabha polls. 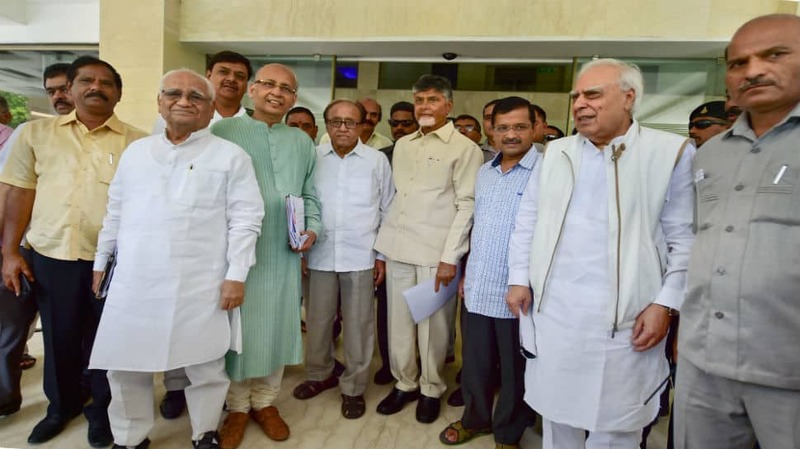 “The so-called all-party meeting convened in Delhi is nothing but a confession of defeat by the so-called Mahagathbandhan. They are already trying to find excuses for their impending massive defeat. Mr Naidu may travel to other parts of the country to jointly cry over their impending defeat in the national and assembly polls. “This is an indication that the so called grand alliance looks extremely depleted, completely frustrated and this alliance is looking for massive excuses for impending defeat,” the BJP leader said. Reacting to Congress’ demand for a thorough probe into the alleged transportation of a “suspicious black trunk” in Prime Minister Narendra Modi’s helicopter during his visit to Chitradurg in Karnataka, Rao said these are baseless allegations and the “Congress party which is synonymous to corruption” should come out clean on their issues.